It’s no secret that I am a bit of a shop rat. I have spent many, many hours in garages, personally and professionally. I’ve learned a few things along the way. While there are lotsa folks who can put me to shame mechanically, I like to style myself an above-average wrench. (Don’t we all?) As such, to follow up my first list of garage hacks, I humbly submit another little list of friendly tips that might make your next wrenchy-time a bit more successful. Valve cores and the associated removal and installation tool. If mounting tires makes you want to scream, this trick might improve your mood some. RevZilla photo. I've often seen folks with home air compressors struggle to seat beads on tubeless tires. It might seem obvious, but if you can get air into the tire faster, you’ve got a way better chance of getting the beads to seat. Pull the valve core with a valve core tool, then start gunning shop air into the tire. Run the air in, get the beads seated, then disconnect the air line. Sure, you have to fill it twice, but it might be the difference between seating the beads and not. It's so simple, but not everyone knows to do it. Sure, it's a little hokey, but coat hangers ain't hard to come by, and a little right-hand-relief can come in handy on the road. RevZilla photo. A good buddy showed me this trick a few years back. For “Hutch’s Economy Cruise Control, Pat. Pending,” twist a length of coat hanger around your grip until friction allows the throttle to stay where you put it. Rest the twisted section of hanger against the brake lever, and voilà! Instant throttle lock. I know many of you get to where you’re camping and pound a beer, as I do, so you can crush the can for a jiffy stand plate. I prefer this method because beer. But there’s another simple solution. Well, there are a few. 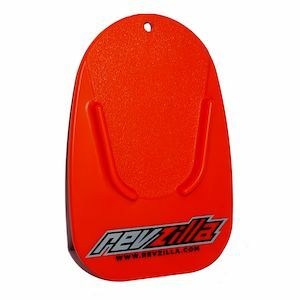 You can spring for a fancy RevZilla kickstand pad. (The product video is worth watching if you always wanted to learn about the intricacies of sidestand plates.) But if you're not looking to purchase anything from my favorite retailer, electrical junction box covers are easy to score for free if you do any construction work. (They're unbelievably cheap to buy if you don’t.) I always carry at least two on a run: one for me, and one for the guy parked next to me, so his bike doesn’t decide to take a nap and ruin my sheetmetal. Here's a wheel bearing I swapped recently. I took a different approach to this one: I spot-welded a washer to the inner race, and then tacked a long bolt to the washer. I then flipped the wheel over, and after two persuasive thumps, the whole shootin' match dropped out of the wheel. RevZilla photo. If you have to replace sealed wheel bearings and don’t want to purchase an expensive bearing puller, you’re in luck if you know how to weld. Weld a small scrap of metal to the inner race. Flip the wheel over, and using a punch, tap the bearing out. This works well for neck cups in your frame as well. This does destroy the bearing, but hey, they’re cheap, and you were pulling 'em out anyway, right? This is a trick I’ve been doing forever. If you cut off the bottom of your oil container, you now have a totally serviceable funnel — just invert it. If you do the same thing with the cylindrical gear oil containers, you can jam a length of three-eighths-inch hose over the pour nozzle. This can be especially helpful for filling things in close quarters, like radiator overflow tanks. Just run the hose out of the vessel to be filled, then hook the bottle up to the hose and fill away. Tap, tap, tap! There are no locating surfaces, but if you're careful not to damage the seal or side-load the inner race, you can often put a bearing without a super-close interference fit in its home without damaging your tools. RevZilla photo. For installing fork seals, I generally use lengths of PVC pipe cut to the appropriate length. Sealed bearings, like the ones found in wheel hubs, can be driven into place with a socket that has an OD that is the same size as the outer race. If you're installing a tapered bearing that's not blind, you can also flip the old race so the narrow end of the old race kisses the wide end of the new race. Use the old race to drive in the new race, then use a punch on the wide side of the old race to knock it out. Free as free can be. That part of the screwdriver is the bolster, and its shape is not accidental. RevZilla photo. Nicer screwdrivers often have a hex “bolster” near the handle, or in some cases, the tool itself may be made of square stock. 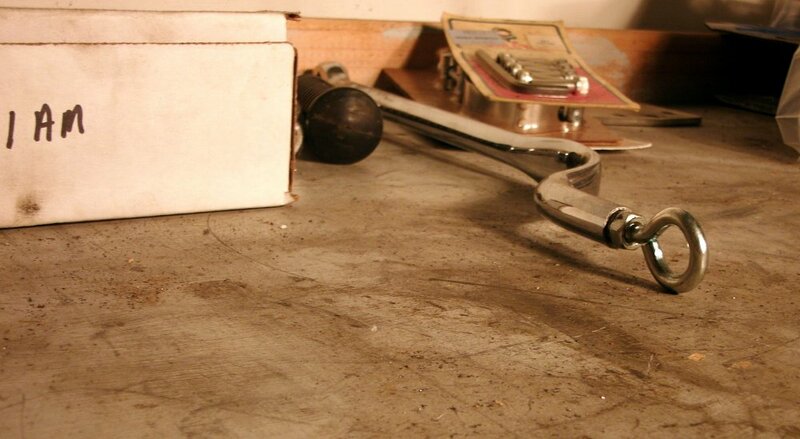 These areas will accept a wrench for those times you need to really crank down on a fastener. This is particularly relevant for Phillips-head fasteners, which are actually designed to allow the tool to slip out. That's fine for install, but once a fastener is frozen in place, sometimes you need to apply a bit more "oomph." Feel free to drop your own shop tips in below. You never know who you might help!